You forgot obscene amounts of fudgsicles. We are currently trying out Starfinder. Playing an Adventure Path titled "Against the Aeon Throne". I'm the GM. We've had 3 sessions and I believe everyone is having lots of fun. I won't say much more because CK *might* read this and I don't want to reveal things I shouldn't. HAHAHA. Three sessions, and we've already had one serious war crime committed. Captain is not happy with this development! What brings you back to this neck of the woods? A mixture of boredom, nostalgia, and curiosity of what's up in the old stompin' grounds, haha. Also Thanatos was beetlejuicing me. TigerStripedDog wrote: I'm jealous you still have your old profile pic/icon. Mine was lost somewhere in the shuffle/updates. No, it was...ah...shoot, forgot his name...he did lots of little cartoon drawings though, for many of the regular posters. Dang, that's gonna bug me for a while, ha. No problem, TSD. Glad to help. And yeah...I'm completely blanking on the name of the fellow who made all those custom avatars, too. It feels like it was a lifetime ago! Well either way it is good to see you. Both you and Thanatos are welcome re-additions to the community. I'll admit my participation isn't constant - but given the recent dust up I was afraid that activity would drop a bit. Halaster for as much as he was a blowhard, did stimulate a lot of conversation. Quality is always better than quantity however. And either way, you and Thanatos are both! Halaster being able to maintain that grognard attitude with that level of intensity for so long is remarkable. It just makes me feel tired thinking how much energy it would take to keep that crap up lol. TSD! Long time no see. You too, JDM! I hope things are well at your end. I don't remember who made the custom avatars as well. Dang. TigerStripedDog wrote: Well either way it is good to see you. Both you and Thanatos are welcome re-additions to the community. I'll admit my participation isn't constant - but given the recent dust up I was afraid that activity would drop a bit. Halaster for as much as he was a blowhard, did stimulate a lot of conversation. Quality is always better than quantity however. And either way, you and Thanatos are both! So is Halaster gone now? I haven't seen him post since Feb 6th with his Artwork post and the reply from JadedDM. While he is pretty hard headed on his views of the game, I share some of his view and enjoyed the conversation. I will let Jaded fill you in on the details Meph but yes Halaster is no longer a part of the community. I'll admit that I too enjoyed the conversation from time to time - but one has to admit that he created conflict and was particularly vitriolic towards staff here. Most problematically was his insistence on violating what few rules Cole has put in place. And man I could have sworn it was CK that made the avatars - my memory must be going now it is going to bug me trying to remember who it actually was. Legion Dethtoll or BlooddancerLegion, one of the two. Think Legion was the artist, and Bloodancer was his friend or something like that. That was his username. Took a while of digging in the wayback machine, eventually made a breakthrough when I remembered, it wasn't always padnd.com, it was planetadnd.com before that. Random clicking through archived pages of the Arts and Lit board finally snagged me a partially saved thread of his Adventure Ho! 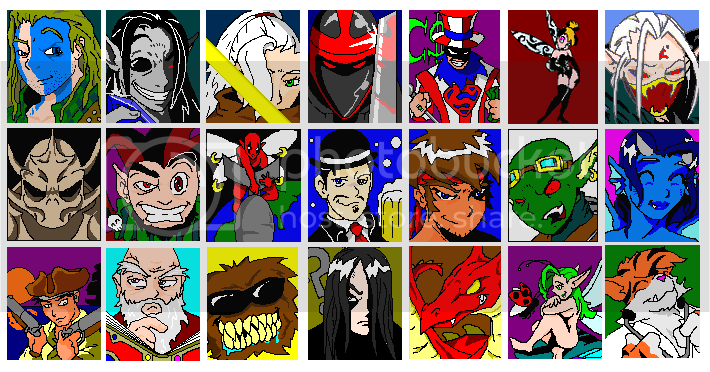 comic he did, with characters based on forum users. Whew. Glad to have that burden gone. That was going to drive me nuts for days. On an unrelated note, after spending a few years of hanging out on Reddit, I gotta say, I missed the personality this little board has. Reddit is so sterile, censorious, and filled with ideological assholes from end to end. At least the ideological assholes here had personality, and not just a bunch of mindless NPCs!